Guateque is a municipality in the Colombian Department of Boyacá, part of the the subregion of the Eastern Boyacá Province. It was founded on 28 January 1636. Guateque is the birthplace of Enrique Olaya Herrera, the 20th president of Colombia (1930-1934). The flag of Guateque is horizontally divded red-white with the bottom stripe charged with two green triangles (representing the mountains) and between them a yellow sun. It was adopted by deree No. 044 of 1999 and was designed by Pedro Jukio Aldana. "The flag representing the municipality of Guateque was adopted by Decree No 044 of 1999, following a competition for the design of municipal symbols. 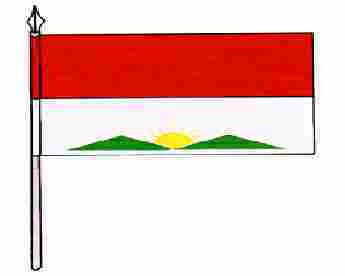 The flag has the two colours red and white and a symbol representing the sun and the mountains, placed inside the white stripe. The author of the flag is Pedro Julio Aldana."